Don’t miss out; places are going fast. The conference is free and there will be a snack lunch for those who book. 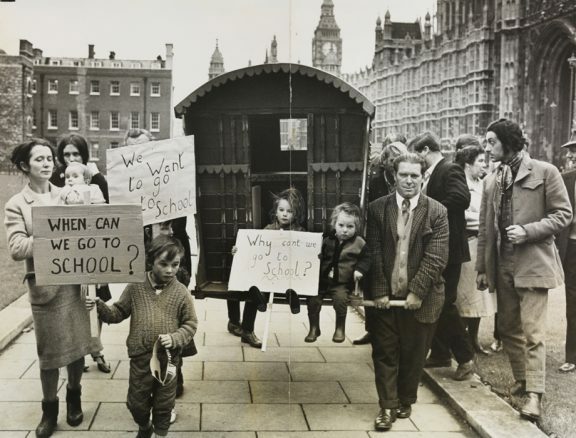 50 years ago a report into Primary Education recognised that most Gypsies and Traveller children were not getting into school, and those who did, weren’t being treated well. Campaigners for Traveller Rights had made submissions to the enquiry, and after it was published used it to raise awareness and campaign for the education and other rights of the communities. To celebrate the anniversary, ACERT’s 2017 mini-Conference and AGM will review what has, and has not, been achieved, and where we can go from here. Over the past few year, ACERT conferences have been interesting and enjoyable events, with the voices of community members to the fore; we believe this year’s will continue in this vein. Please come and share the day with us. Bookstall, Travellers’ Times, Roma history exhibition, Porajmos exhibition, Friends, Families and Travellers . These are provisional lists; check the website for updates. If you would like to participate let us please contact us. We expect this to be a very special event and hope you will join us. What has Traveller Education meant to you? Over the past few year, ACERT has used its annual AGM/mini-conference to provide a platform for community members to share their experiences and perceptions. 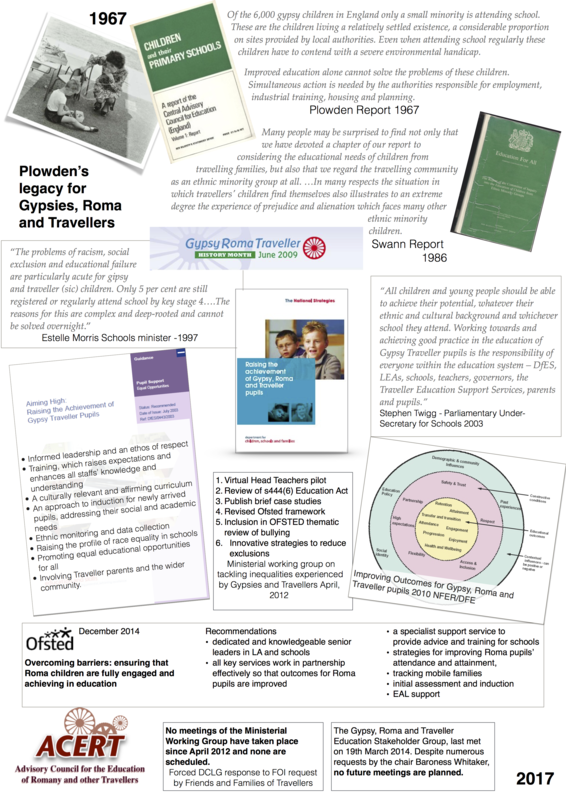 This year, we are celebrating the fiftieth anniversary of the Plowden Report, Children and their Primary Schools, which laid the foundations of Traveller education and child centred education for the decades that followed. 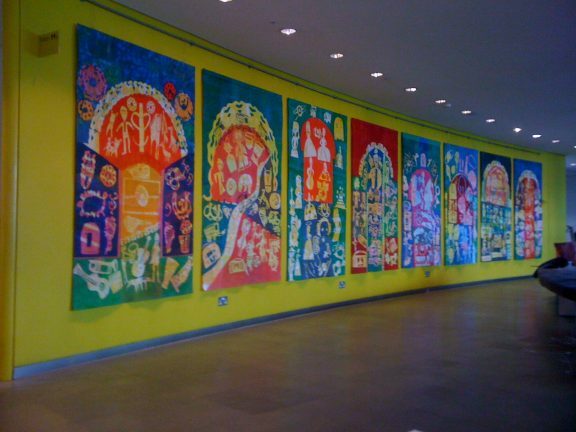 Display of silk-screen prints at City Hall, created in London schools for Gypsy, Roma and Traveller History month. Most Gypsies, Roma and Travellers have stories about how education was for them, how they were treated, what they learned and how it prepared them for the rest of their lives. For most the challenges outweighed the opportunities, and it wasn’t plain sailing for anyone. We’d like anyone with a story to tell, to feel welcome to join us, to celebrate our achievements, recognise our failures and plan the way forward. As well as pupils and former-pupils, students and former students, we’d also love to involve parents, teachers and staff of Traveller Education Services. We hope things have improved over the past fifty years, although we recognise they have not improved enough and it has taken far too long. We hope the day will include some nostalgia, some success stories, a few laughs and some reflection on the lessons learned. If you would like to attend, book your place here. If you’d like to participate, contact us from the website or via Facebook. Author administratorPosted on May 31, 2017 August 16, 2017 Categories AGM 2017Leave a comment on What has Traveller Education meant to you? Arthur Conka, Director and Photographer, Picture Light Productions showing the trailer for his film "Gypsy Gadje"
Valdemar Kalinin, Vice Chair of ACERT, and Saeeda Kasym , professional Russian Roma dancer performed dance and poetry, "From Russia with Love"